Mobile accessory maker ClamCase has unveiled a new docking system that boosts your smartphone's IQ by lending it laptop-like functionality. Although today's top-end handsets are powerful enough for basic computing tasks, their small screens and cramped software keyboards make them far from ideal when it comes to real productivity. Many companies have offered solutions to this problem, with third-party accessories such as the Matias One Keyboard, which lets you type on your iOS device with a desktop keyboard, and better-rounded packages such as Motorola's Atrix. Needless to say, ClamCase's take on the issue isn't groundbreaking, but it's still awfully attractive. The company has unveiled a MacBook Air-like dock that supplies your handset with a full screen and keyboard along with improved sound. The device is fully powered by your Android or iOS handset (and charges it in the process), though it seems more geared toward the former with dedicated Android hotkeys. 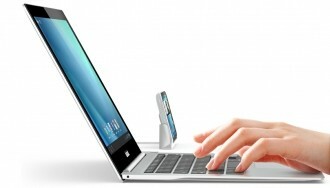 In the case of Ice Cream Sandwich devices, the ClamBook's trackpad supports gestures such as pinch to zoom and two-finger scrolling. The ClamBook can also be used with Motorola's Webtop application. It appears that the ClamBook is still in the making as there are only product renders on ClamCase's site and details are pretty limited. The body is constructed out of aluminum, but the company merely says that it's "impossibly thin" and "incredibly light." The 16:9 display is LED-backlit, but we haven't seen any mention of its resolution. Naturally, there's no word on pricing either, but how expensive can a brainless laptop be? The ClamBook is due to ship in the coming holiday season, so expect more info by then.